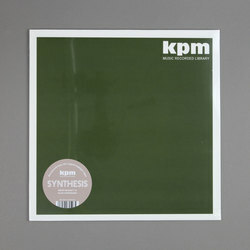 Alan Hawkshaw & Brian Bennett - Synthesis LP (The KPM Reissues). Vinyl LP. Bleep. “Vivid contemporary sounds for a fresh visual image”! At least, that’s what the KPM Recorded Music Library were saying about Alan Hawkshaw & Brian Bennett’s Synthesis LP when it first saw light of day back in 1974. An accompanying piece to their album Synthesizer and Percussion (also now reissued by Be With Records), Synthesis is one of those golden age library records that effortlessly brings together elements of big-band jazz, jazz fusion, funk and soul. You can hear the genesis of everything from G-Funk to Stereolab in here.